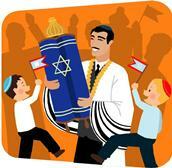 Did you know that Simchat Torah is actually a ceremony during Shemini Atzeret? I didn’t, or at least I didn’t remember it. Most people I know simply refer to the upcoming holiday as Simchat Torah. Shemini Atzeret is a two-day holiday, beginning on October 21, 2011 (don’t forget, Jewish holidays are not celebrated on the same date on the Gregorian calendar as other non-Jewish holidays do) and ending on October 23, 2011. We celebrate Simchat Torah immediately following the end of Succot. The word “simcha” means “joy, celebration, rejoicing” in English. So, on Simchat Torah, we are rejoicing over the Torah (the Five Books of Moses). This is because on Simchat Torah we complete our reading of the Torah and we begin it all over again. Many things happen in our celebration of the Torah, we eat, and eat, and eat. We say Yizkor, which I explained in my Yom Kippur article. We add a blessing for rain. This is the only time that we give a Torah an aiiyah (aliyah has two meanings, 1) a high honor; 2) immigrating to Israel. In this case it means “a high honor”). This is the only time that we have three Torahs out during a Torah service. And this is the only time when we take all the Torahs out and we dance with the Torahs and sing joyous songs. The children get a Jewish Flag on a stick and an apple and they parade around waving their flags and holding their apples. It is a great celebration and a lot of fun. The traditional dish of Shemini Atzeret is stuffed cabbage. Although Paul loves it, you won’t find this dish in my house! I can’t stand the smell of the cabbage cooking, let alone eat it…yuk! But this is a menu that I can live with and yes, I’ll post a recipe for stuffed cabbage also. This is a Scottish soup recipe. Place a large Dutch oven on the stove with 10 cups of water. Bring water to a boil and keep it warm on the stove top. In a separate stockpot, add butter and onions and cook over medium-high heat until the onions turn translucent. Add the ginger to the pot. Season with salt and pepper to taste. Add the shredded carrots to the stock pot and mix well to combine the ingredients. Squeeze in the juice from the lemon and pour in the honey. Stir the mixture well to blend. Pour in the 10 cups of hot water and cook the soup on a gentle, rolling boil for 45 minutes. When the soup is cooked and the carrots are tender, transfer the soup into a food processor in batches and puree until smooth. Dish the soup out into individual serving bowls and add a little cream to each bowl, running it through with a butter knife or spatula. Garnish with the chives. Arrange the tomato and mozzarella slices on a platter or individual salad plates, overlapping the slices and fanning them out like a deck of cards. 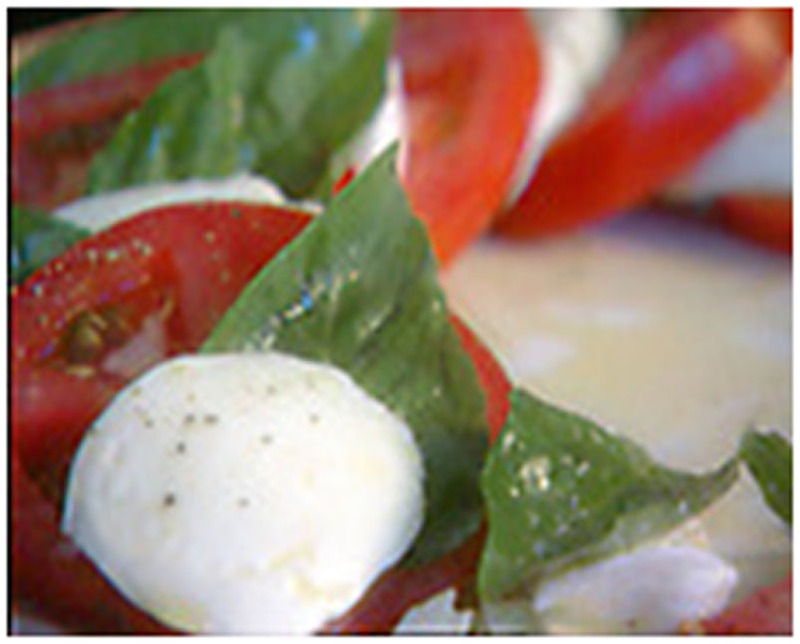 Garnish with the basil: Cut it into very thin slices or tear into bits and sprinkle on top or leave the leaves whole and tuck them here and there between the mozzarella and tomato slices. Serve immediately. Pre-heat oven at 450F (230C or Gas Mark 8). Clean the trout if required, remove the scales and fins and wipe with kitchen paper. Season the inside of the trout with salt and pepper and insert the herbs. Cut four pieces of kitchen foil into oval shapes which are long enough to take the fish plus an extra 3″ (7cm) foil. Brush the foil with olive oil and place each trout in the centre. Brush the outside of the fish with olive oil, season with salt and pepper and pour a tablespoon of vermouth over each fish. Pull the foil up to make a boat shape for the fish and pleat over the top to totally enclose the fish, making sure it is pinched together. Place on a baking sheet and bake in a pre-heated oven at 450F (230C or Gas Mark 8) for 8 to 10 minutes. The time will vary, depending on how plump the fish are. Check by opening up foil and examining the flesh at the thickest part. There should be no opaqueness or pinkness. The fish can be served in the foil with fresh vegetables. SOFTA’S DISCLAIMER: This photo is not a photo of this recipe. It is a Photo I found on the internet that looks similar. Beat eggs and sugar until light. Add melted butter and vanilla. Add cottage cheese and sour cream. 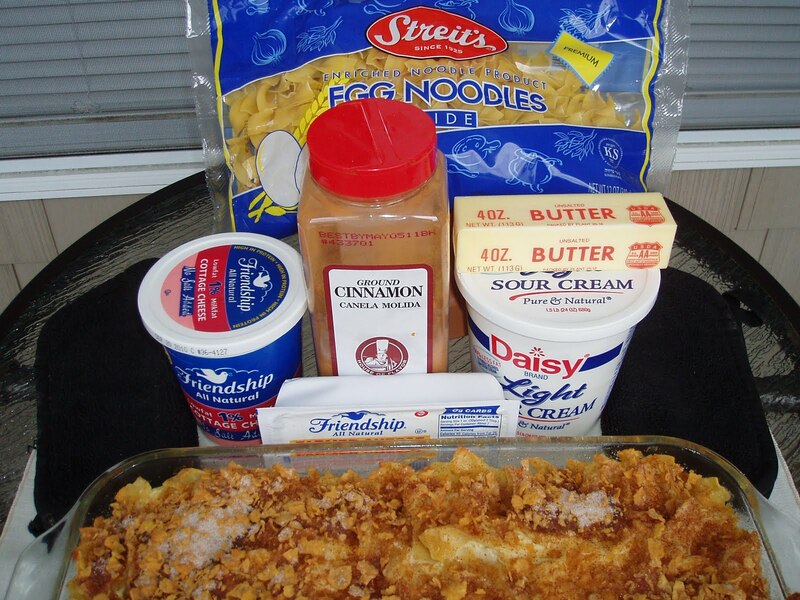 Add noodles and mix well. Put in greased 9×13 pan. Mix crushed graham crackers with sugar and cinnamon and sprinkle over top. Here is a refreshing dessert which uses marmalade which is a popular ingredient in Scottish cooking since its invention in Dundee in 1797. 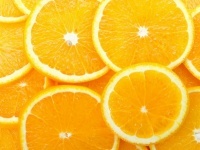 Place the oranges in four long-stemmed glasses and, if you want, add a teaspoon of brandy (or rum) to these. Add the cream on top. Garnish with some orange zest (boil for a few minutes in water to reduce the bitterness). 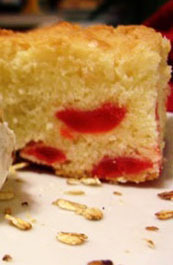 Cherry cake, with icing on top, is one of the mainstays of Scottish home baking tearooms. Preheat the oven to 160C/325F/Gas Mark 3 (or slightly higher if not an electric fan assisted oven) and line a baking tray (8″ x 12″ x 1½” or 20cm x 30cm x 5cm) with parchment paper. Wash, dry and chop up the cherries to remove the glacé coating (but retaining some as quarter cherries to decorate the top later). If you coat them in some flour it will stop them sinking to the bottom of the cake. Cream the margarine and sugar together thoroughly until light and fluffy (to help the cake rise with the trapped air). Beat in the eggs, one at a time, until smooth. Stir in the flour and then add the cherries. Spread evenly into the tin and bake in the middle of the oven for about 40 minutes. Allow to cool in the tin. Add a little water at a time to the icing sugar (frosting) until it has a consistency which coats the back of a metal spoon without running off. Remove the cake from the tin and spread the icing sugar evenly on top. SOFTA123’S NOTE: The next recipe, the recipe for stuffed cabbage, does not go along with the above menu as the stuffed cabbage recipe is for a meat meal and the menu is for a dairy meal. 1 medium green cabbage. You’ll need 4 cups (if you don’t have enough, supplement with leftovers from the large cabbage). In a large bowl, combine all the stuffing ingredients. Stir them with a fork, then mix thoroughly with your hands. Cover and refrigerate. In another bowl, thoroughly mix all sauce ingredients. Cover and refrigerate. Fill a very large stockpot three-quarters full with water and bring to a rapid boil. While bringing the water to a boil, use a thin, sharp knife to make deep cuts around the core of the large cabbage (cut into the cabbage in a circle about 1/4 inch out from the core). Lift out the core, making a hole about 2 inches wide and 2 1/2 inches deep. This is a bit difficult — persevere. Set out a baking tray neat the stove. Stick a long cooking fork into the core hole of the large cabbage, and plunge it (carefully, so you don’t splash yourself) into the pot of rapidly boiling water. The outer leaves will begin to fall off. Leave them in the boiling water for a few minutes until they’re limp and flexible enough for stuffing; then take them out one at a time, and place them on the baking tray. Try not to tear the leaves. When all the leaves are on the tray, transfer it into the sink and pour the boiling water from the pot over them. Wash the leaves carefully in cold water. With a small, sharp knife, trim off the tough outer spines and discard them. Find your largest leaves, and set them out on a plate. Set out all other leaves on another plate. One at a time, line each large leaf with another large leaf or two smaller leaves. (The idea is to strengthen your cabbage wrapping so that the stuffing stays securely inside during cooking. Be sure to align the spines of inner and outer leaves.) Stuff with 3/4 cup of the meat-rice mixture, roll very tightly along the spine, and close both sides by tucking them in with your fingers. The spine should be vertical in the center of tour roll. Stir the 4 cups of chopped cabbage into the sauce. Pour 3/4 inch of the sauce into a large, wide-bottomed stockpot. Arrange the cabbage rolls carefully on top of the sauce, and pour the remainder of the sauce over them to cover. Cover pot and simmer for 1 hour and 45 minutes. Serve with boiled potatoes and a vegetable. Paul and I wish everyone at Gut Yom Tov!